Hopkinson Report interview with Blogger, Podcaster, Entrepreneur, Speaker, Author, Marketing Guru Mitch Joel. 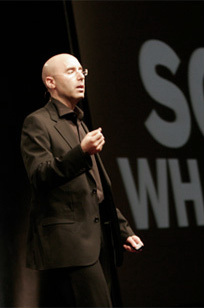 What does Mitch Joel have that almost every other “social media expert” doesn’t have? While my Julia Allison interview is still my most downloaded episode ever, Saul Colt is the smartest man in the world, and my talk with Sarah Prevette confirmed she is the very definition of Malcolm Gladwell’s “connector,” my conversation with Mitch was one of the most engaging and interesting talks on the current state of internet marketing I’ve had to date. How many other people started out as a music journalist with their first assignment ever being an interview with Tommy Lee from Motley Crue? Considering he owns his own digital marketing agency called Twist Image, has been blogging since 2003 (which is why we discussed consistency over relevance), and also does a podcast. Why did he go through a traditional publisher with his new book, Six Pixels of Separation? When I asked him if he thought about self-publishing with any of the new and impressive tools that are available, or distributing the book as a PDF or some other form, he said no. Why was that? He was writing a book for people that read books! It seems quite obvious, but if some is dialed in and is already reading his work online via his blog and listening to his podcast digitally, they’re already aware of him. This is for the guy browsing in Barnes & Noble or running through the airport that wants a marketing book and has never heard of him. And get this, he ENJOYED the book writing process. Not many authors will tell you that. – OK, so what about public speaking? Mitch is an accomplished speaker, having presented to Starbucks and Microsoft, sharing a stage with people ranging from Bill Clinton to Dr. Phil, and drawing from his arsenal of thousands of slides to wow any audience. Maybe you’re an expert in your field as well, and want to do more speaking, or teach a class, or be on a panel. – So what is the thing that Mitch has that nearly every other potential speaker is missing? Wow, that was obvious, right? But think about it… without all these elements, how can a company or conference have any confidence that you are a prepared professional that can pull this off? It’s like a resume for your public speaking persona. I see this as a huge opportunity for people looking to get into this field, raise their profile, or try to generate additional revenue. 1) Fear of public speaking is right up there with fear of snakes and fear of dying. If you LIKE public speaking, you are ahead of 90% of the game. 2) A lot of people are bad at public speaking. If you practice, can weave a good story, and are prepared, you jump ahead of all of those people. 3) If you can put it all together and demonstrate to a potential company or conference that you can do this through a speakers page when no one else is, that should put you to the top of the list. Mitch goes on to talk about several other great tactics, including books to read and gadgets to use. Download the podcast from iTunes, or play it below: — we start talking speeches at the 22:54 mark. View the full transcript of the Mitch Joel interview. This entry was posted on Friday, October 2nd, 2009 at 2:46 am and is filed under Branding / Advertising, Facebook, Interviews, iPhone, New York City, Social Networking / New Media, Twitter. You can follow any responses to this entry through the RSS 2.0 feed. Both comments and pings are currently closed.